You are here: Home / Blog / blog / Let’s talk music! I love it when an act has really good music. When it hits the exact right emotion. Especially when you’re performing your own act and you hear your music over the PA in the theater. Goosebumps! When I did HGT (Holland’s Got Talent) this season and I heard my whip cracking on the beat of my custom written music, it made me so happy! My music really helps me to perform. Even when I practice new effects at home, I almost instantly try it on some music. You will notice that you’re immediately quicker. Your facial expressions, little gestures and mannerisms are instantly present. I am very fortunate to work with my own composer www.ryanmartinmusic.com . When I need a composition for a TV show or a corporate gig, I send him a short brief and mostly within 24 hours, I have a track. What I’ve also noticed; and what we Magicians and performers usually forget is music rights. Ryan can tell you everything about it, so if you have any questions, contact him, but here’s what I do know: if your music is custom made for you and its royalty free, you will never have a problem when you get broadcasted. Another big plus of having custom written music: you take the option of having the charts created to give to live musicians. 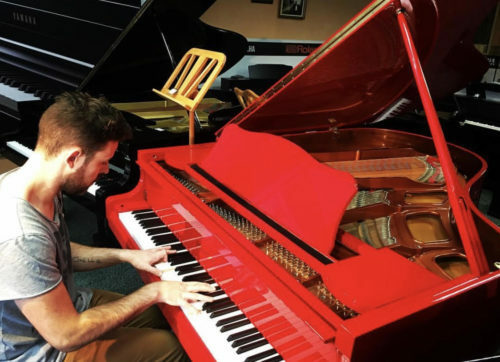 So if you perform in a circus or cruise ship where you must have live music then you can still have the comfort of your own music that you know works. 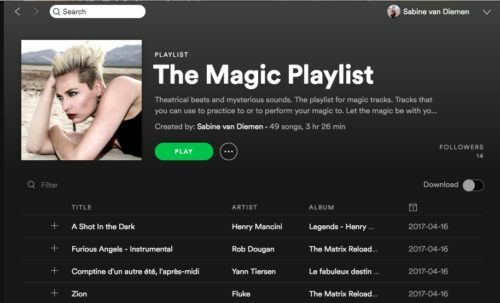 Last but not least, I’ve made a little Magic playlist on Spotify (The Magic Playlist) that you can follow, with common magic music, it is there to practice your magic to and also to get inspired what kind of music you want to use. But please take my advice, like you do on your props and your costumes, spend some money on custom written music, it will be so worth it! And we all know we cannot use “The Matrix Reloaded Album” anymore to perform magic to! http://sabinevandiemen.com/wp-content/uploads/Tophat.jpg 808 1125 Sabine van Diemen http://sabinevandiemen.com/wp-content/uploads/Logo_Png-1210x423.png Sabine van Diemen2018-03-31 20:04:542018-04-05 17:08:03Let's talk music! It’s a man’s world… Amsterdam Magic 2nd year anniversary!